BUDGET 2014 UPDATE: Canada has cut funding for athletes in real terms for the 10th year in a row. Since our coverage last year, and in the midst of coverage of the 2014 Winter Olympics in Sochi, Russia, the Government of Canada has continued to leave support for elite athletes unchanged since September 2004. Jasmine Northcott, executive director of AthletesCAN1, said in a statement that funding had not been increased, but that some sportsmen and sportswomen will benefit from proposed changes for Registered Retirement Savings Plan (RRSP) contributions. She said: “The individual funding – called “carding” or the Athlete Assistant Program – for athletes by Sport Canada has not been increased in this federal budget. She added: “Athlete earnings are quite diverse, so while this might not affect all athletes, having the opportunity to apply this allowance when needed is positive. The Canadian Paralympic Committee “applauded” the government in a press release after the budget – officially titled “Economic Action Plan 2014” – was announced on February 11. It stated: “The Canadian Paralympic Committee (CPC) applauds the Harper Government for its 2014 Federal Budget, which continued the Government’s record level of support for sport, in particular the CPC with $5 million. Continue reading for Tomorrow’s coverage or sport funding last year. FUNDING for Canada’s top athletes has been cut for the ninth year in a row, Tomorrow can reveal. Against rising costs and the annual rate of inflation, Government of Canada cash to elite athletes is unchanged since September 2004. Despite increased total budgets for sport from the department of Canadian Heritage, it is spread among more individuals and is now at least 16 per cent below where athletes groups argue it should be. AthletesCAN, representing the Canadian national team, including Olympic and Paralympic athletes, warned that the funding deficit threatened “national unity”. In a follow-up to our London 2012 Paralympic coverage, Tomorrow asked the government what public funds were committed to elite athletes. The federal budget, published in March, only outlined the previous year’s spending on sport, not that for 2013-2014. Pierre Manoni, a spokesman for the department of Canadian Heritage, of which Sport Canada is a part, said the Athlete Assistance Program (AAP)3 was last assessed in 2004 and is still set at $1500 per month for “senior athletes” and $900 per month for “development level”, paid directly to athletes and all tax free. 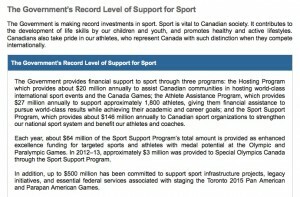 Total spending for 2013-2014 on AAP will be $28 million, with another $145.8m for the Sport Support Program4 – to individual sports organisations, to the Canadian Paralympic Committee and other national groups and to sports centres – and $146.1m for the Hosting Program5, for hosting Canada Games and international sporting events. Based on the Bank of Canada’s annual inflation rate, individual athlete funding is now 16.08 per cent below rising consumer costs 6. AthletesCAN has calculated that by 2020, funding could be almost 40 per cent below inflation. Jasmine Northcott, chief executive of AthletesCAN, which represents more than 2500 senior national team athletes, said the organisation has been pressing for increased athlete funding for years. She said: “There is a growing funding gap between the budget for direct support to athletes and the expectations on athlete performance, the cost of living and training, and the goals of Sport Canada programming. Ms Northcott said they have asked government to increase funding for the AAP to account for cost of living increases in the past eight years to bring parity with the level of support granted in 2004. She said: “The legacy of the 2010 games is built on the story of athletes who commit their lives to achieving excellence in their sport and representing our country. Looking ahead to 2014, 2015 and 2016, we want to ensure athletes have the direct funding they need to ensure Canada owns the podium. “The country beared witness to the sporting achievements of our athletes in 2010 and 2012, inspiring unprecedented pride from coast to coast to coast. AAP funding rates are the same for both Olympic and Paralympic athletes. It is also boosted by grants of $6000 per year for those who have won medals at world championships or Olympic or Paralympic Games. There is an additional $6000 per year available to some Paralympians with particular needs. The Canadian Paralympic Committee7 initially praised the 2013 federal budget, with president David Legg stating it demonstrated “a strong willingness by the Federal Government to renew its funding towards the CPC’s efforts in developing a stronger parasport system across Canada, while ensuring that our Paralympians receive the necessary support and have access to an optimal environment to excel on the world stage”. 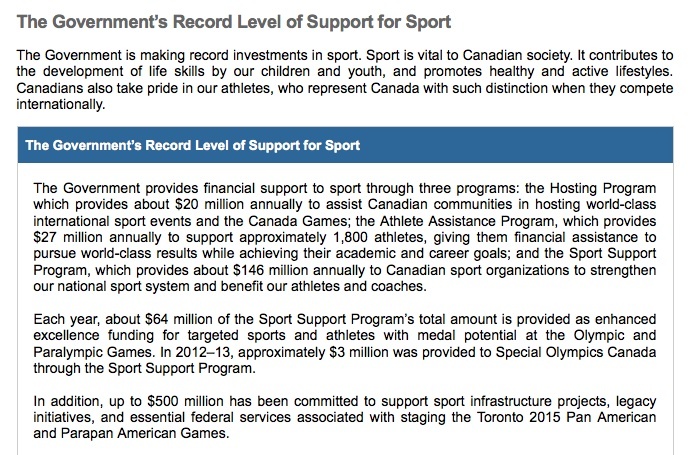 The CPC referred questions about the individual support for athletes to the government. With government funding for athletes static, building a legacy from the 2012 games could be left to others. Among those athletes interviewed by Tomorrow during the games in September, there is no clear answer of who is most responsible for ensuring a legacy. 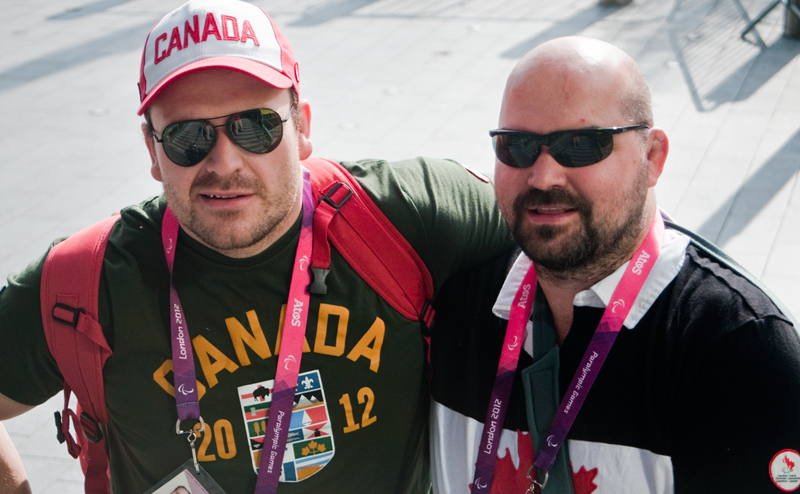 Tim Rees (left), 32, of Victoria, BC, and Tony Walby, 39, of Ottawa, ON, competed in judo at the London 2012 Paralympic Games. First-time judo Paralympian Tony Walby8, who has an degenerative eye condition, said he wants more attention given to disability sport, beyond once every four years. The 39-year-old from Ottawa, Ontario, told Tomorrow by email: “I speak more openly now about my visual impairment and I try to encourage other people I meet who have similar challenges to try sports – even if it’s not judo. “London brought the Paralympic sport into the spotlight for a short period. Athletes are working year round on their sport and hopefully one day the Canadian press will offer more coverage than a daily highlight reel for the Paralympic Games. “I have not seen a change in general attitudes – it seems that people only care about disabled athletes every four years. Swimmer Morgan Bird9 celebrated her 19th birthday during the London games. The native of Regina, Saskatchewan, said London did a “spectacular job” as host, as did the event’s official UK broadcaster, Channel 4. “I can’t say that for North American networks,” she said. “Lots of people were trying to watch back home but coverage was non-existent, unlike [for] the able-bodied Olympics. She added: “With improved coverage, people will see disabled athletes not as ‘disadvantaged’, but as athletes with different and amazing capabilities. For judo Paralympian Tim Rees10, the games are now mostly a distant memory. Family is the top priority, but he knows it will be athletes like him who will ultimately ensure a legacy of London 2012. “I haven’t done too much about a legacy,” said the 32-year-old from Victoria, BC, in an email. “I have a new baby son and I have been trying to spend more time with my family. I hope to get back into judo when my kids are a little older. “I think the athletes and coaches who will inspire the next wave of competitors are most responsible – the people who are actually out on the field, or mat in the case of judo. “I hope there are more programs to get new members involved Canada-wide, right now most visually impaired people probably do not have much info about judo if they are not in Ontario. A record 2.7 million spectators attended the London Paralympics, with Canada winning 31 medals, seven of them gold. The AAP was created in 1977 and supported Paralympians competing in 26 sports totalling $4.5m in 2012-2013. In 2015, Toronto will host the Pan American/Parapan American Games11. The Government of Canada said in the budget, “up to $500m has been committed” to projects and services associated with the event. No issues for principles 1, 3, 4, 5, 7, or 9. 2. Accuracy: Tomorrow’s analysis of inflation was prepared prior to contacting AthletesCAN who presented near identical figures, having been calculated in 2010. 6. Duty to openness: copies of government emails from the press office are available on request. 8. Safe harbour: no safe harbour issues as press spokespersons are not granted anonymity. 10. Educate and entertain: The budget did not present 2013-2014 spending on sport, just the previous financial year. The department has confirmed upcoming spending. 11. Promote responsible debate and mediation: How much funding should athletes get? Are elite athletes central to a sense of national unity? This entry was posted in News and tagged Canada, Paralympics, sport on April 11, 2013 by Tristan Stewart-Robertson.